Those manic Hockeytowners have survived one more round. The defending champ Red Wings took out previous champ Anaheim in the West semis, but let their fans stew in self-doubt for 6 games and 57 minutes before advancing. So the NHL Final Four is here, featuring four working-class cities synonymous with hockey: Detroit, Chicago, Boston, and Raleigh. That's right, the Carolina Hurricanes, the 2006 Stanley Cup champs are back on the threshold after a second improbable series win. The team that left broken hearts behind in Hartford continue to succeed in the 919, and are getting downright dramatic about it. In the opening round, they were 80 seconds away from elimination in Newark, before scoring twice in regulation to stun Martin Brodeur, the Garden State faithful, and the hockey world. The Hurricanes finally beat Thomas on a rebound toward the end of the first extra session. 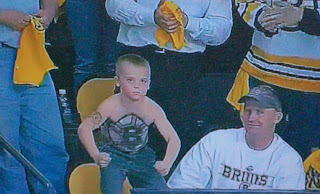 Bruins fans still saluted their team after their best season in a long time. But Boston faithful don't get much of a breather after the Bs were eliminated. The Cs host Orlando on Sunday night and it will be the 3rd Game Seven at the New Boston Garden in a fortnight. In fact, there will be two Game Sevens in the NBA on Sunday, including the bi-polar Lakers taking on the under-manned, over-compensating Houston Rockets. More appointment viewing ahead this weekend.